A mother’s outside-of-the-box advice on car seat safety has set Facebook alight after sharing her advice on a simple “pinch test” that could save lives. US mum of three Rachel McNamara blogged that parents should be sure that every time they strap their child in for a car trip, they are safe. The Facebook post has gone viral, clocking up more than 49,000 shares. 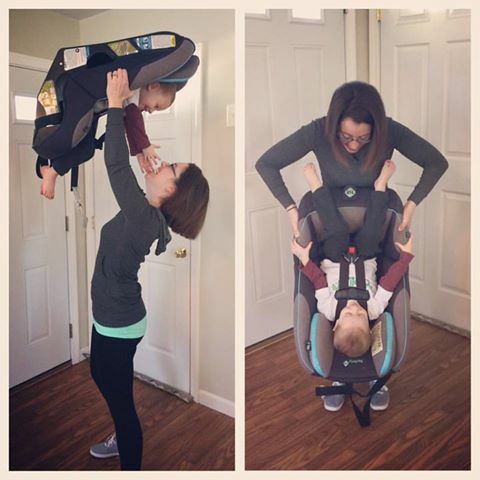 “After strapping your child into their car seat, ask yourself if you’d be comfortable flipping it upside down. Remember that the chest clip should be at armpit level and the straps should be tight enough to pass the pinch test,” she wrote. Rachel reiterated in her post that parents should also read the instructions provided by the car seat manufacturer. Many parents commented that Rachel’s post would help save the lives of hundreds of children around the world. “This is great information and it will save lives of children,” one mother wrote. “I’m so glad you have made this visual!!! (sic)”, another mother wrote. Wow! Just, wow. I never thought this would get so many shares. Otherwise I may have changed my clothes first. 😬 This is becoming quite a long post, but I promise it’s worth the read! I’ve also added some helpful links. ❤ First, DO NOT ACTUALLY DO THIS. I’d like to clarify that I’m not advocating that parents should be flipping their kids upside down before every car ride.